If you’re looking to keep baby safe this summer, protecting them against the sun’s harsh rays is one of the most important things you’ll need to focus on. Baby’s skin is ultra-sensitive and therefore a lot more prone to serious burns. Studies have shown that children who suffer serious burns are at an increased risk of developing melanoma, or skin cancer, later on in life. But is protecting baby’s skin as simple as just applying sunscreen? Can babies even wear sunscreen? Below, you’ll discover everything you need to know. At What Age Can Babies Wear Sunscreen? Ideally, babies shouldn’t wear sunscreen until they are at least six months of age. However, while previous guidelines from the American Academy of Pediatrics stated babies should never wear sunscreen until six months, they have been recently updated. Now, the new guidelines state a baby-safe sunscreen of at least 15 SPF can be applied on small areas of the body, such as the back of their hands and face. That being said, it is still advised to avoid using it and instead keep baby in the shade, especially during peak times of the day. Once they reach six months of age, sunscreen can start to be applied to any exposed part of the body. However, before doing so it’s also recommended you do a patch test. Apply the sunscreen to a very small patch of skin 48 hours before you plan on heading out in the sun. This enables you to see whether any adverse reaction occurs and that the sunscreen is likely safe to use all over the body. Why Is The Use Of Sunscreen Advised Against In Young Infants? The reason experts do advise against using sunscreen on infants is because of the chemicals it contains. Even baby-safe sunscreen can still contain chemicals which could prove harmful to baby if too much is applied. So, why don’t these chemicals affect adults and slightly older children too? It’s actually down to a few different factors. One of these is the stratum corneum; a layer of skin which protects the body against outside elements. In young babies, this layer of skin is a lot thinner. They also don’t have an acid mantle (a protective film on the surface of the skin) which means they aren’t fully protected against bacteria and they don’t yet have an adequate sweating function. Finally, the ratio of surface skin to body weight is much higher. This means that any chemicals applied to the skin will have much more of an effect on the body if they soak in. Put simply – it’s easier for chemicals to pass through the skin and into baby’s bloodstream. There’s also an additional risk that baby could swallow the sunscreen accidentally if they place their fingers in their mouth. When it comes to choosing a sunscreen for your little one, ideally, you’ll want to consult a doctor or pediatrician. That way, they can tell you exactly whether or not the brand you’re thinking of using is right for your baby. However, there are a few general pointers you can follow to help narrow down your search. As chemicals absorbed into the skin are a potential concern, there are a couple of ingredients you can look out for. Sunscreens containing zinc oxide and titanium dioxide are considered safer for baby’s due to the fact they are derived naturally from minerals. They also don’t absorb into the skin like other chemicals can. You can start out by searching for sunscreen on Amazon that claims to be baby safe, and narrow down your choices from there. Although these tips are useful to follow, they should only be used as a rough guideline and seeking advice from a doctor is still recommended. While sunscreens containing titanium dioxide and zinc oxide are designed to start working instantly, it’s still advised to wait 15 minutes after application before you expose your little one to the sun. If baby is younger than six months, following the advice earlier and applying very small amounts to only certain parts of the body is advised. However, if baby is older than six months, you’ll want to make sure you apply a healthy amount to all exposed areas. Pay attention to parts of the body which are more at risk of burning such as the nose, ears and lips. It’s also important to remember to keep reapplying every couple of hours or so. If baby gets wet or you’re out in the sun for long period of time, you’ll want to apply the sunscreen more frequently. 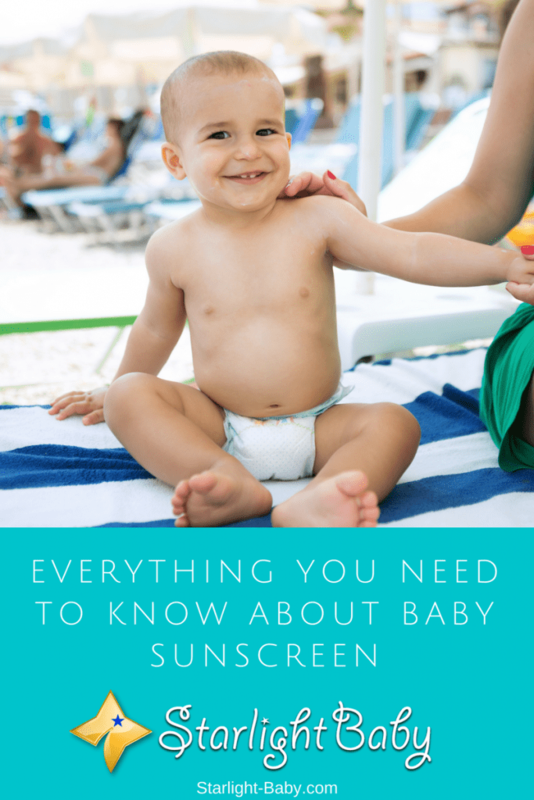 Overall, when it comes to keeping baby safe in the sun, a good quality sunscreen can help. However, it’s more important to keep baby covered up and in the shade between the peak hours of 10am until 4pm. Always seek advice from a doctor before using any new product on your baby’s skin. Choosing the right type of sunscreen for that delicate skin is of paramount importance and in your blog you have rightly highlighted it. Just want to know about eye protection. What do you suggest? Fortunately there are a lot of choices for baby and toddler sunglasses, a lot of baby stores will have them or you can also purchase them on Amazon. These are only really needed if they’re going to be in the sun for a long time though, or they’re in an area where sunlight is reflecting up off the ground and into the eyes. Other manufacturers have done a great job scaring people into thinking they need to be wearing sunglasses at all times or they’ll have vision problems in the future, but it isn’t true in most cases. Of course, wearing sunglasses anyway never hurts, but it’s important to keep in mind that they aren’t perfect solutions either. Protecting the baby’s skin is very important, which sunscreen do you recommend for babies? Hi Okolo, thanks for asking! Taking the above considerations into account I would recommend looking for sunscreen on Amazon or local stores that fit this criteria and comparing reviews. We don’t have one specific recommendation right now, or any brand preference. Thank you so much for this helpful information. I don’t think people has a real idea of how important it is to protect our skin of sun rays. And it’s even more important when it comes to babies. It is great to have acces to this kind of tips about protecting our babies skin. This is very important for our toddler, but if the most of the sunscreen contains chemicals than we should not use them. What about something natural? Did you hear about the olive oil? Many people use it here in my country just because it is natural, and protects the skin very well from the sun. It’s my first time to hear that olive oil is used as a sunscreen. I actually Googled it and apparently there are some who use it for the said purpose. If I were to choose, I would go for organic sunscreens because they don’t have harmful chemicals and pesticides that get into our system. We need to be very careful, especially if it’s babies or children who will be using it. We cannot just use anything on them, especially those that have harmful ingredients. We have already been to the seaside this year and one thing that we never forget is putting sunscreen on our toddler. It is just so extremely important that we protect their sensitive skin from the UV rays. Especially if they are like my boy and love playing on the beach with the sand. I agree that it is best to consult with our pediatrician because ours really helped us pick out the right product. Before we asked him, we were confused about which brands are the best and so on. Besides the sunscreen, we also make sure that he wears one of those sun protecting hats/caps. Thank you again for the great tips! Good thinking there, Jane. UV rays are bad for the skin so we should always protect ourselves, whether babies or adults. With so many products in the market these days, it’s really hard to choose. Good thing you asked your pediatrician about it. They are usually the best person to give advice on the safest products for kids. I have a three months old child and I have never considered using sun screen on him, simply because we don’t take him outdoor. We, of course, give him sun bathe in the morning around 8 or 9 o’ clock when the sun is soft and mild, however, we never expose him in the day time sun. In case we have to take him outdoor (which we did when we were taking him for vaccination) we used clothes that covered his entire body, including head and feet. I will never try sunscreen on my babies until he begins to walk, that will be around 12-14 months. The best way to prevent sun rays on young skin is by covering the skin with clothes. THis is the safest way to prevent dun damage in your baby. You’re right, vinaya. At a very tender age, no chemically-laden products should be used on babies. Their skin is very sensitive so chemicals could easily harm them. As you’ve said, use clothing instead to cover them and protect them from the sun. I never used sunscreens on my kids when they were babies, too. I only used it on them when they were older and only if really necessary, like when we go to the beach during summer. For me, the best suggestion you have mentioned is to consult a pediatrician first before trying to use a sunblock for the baby. If ever the baby will be allowed to use one, it’s much preferable to choose a product that does not contain paraben. Paraben is an artificial preservative usually found in skin products. It is also used as an ingredient in formalin. Long term use can cause skin problems. Also, I can relate to your suggestion about covering the baby with clothes when going out between 10 AM – 4 PM. I don’t see anyone here applying sunscreen to their babies. They usually avoid taking their babies outdoors at those times. They also cover the baby well. I will apply these suggestions too once I have my own baby. That’s true, Krisleen. Consulting a pediatrician before using sunscreen (or any products that could be harmful to babies) is a wise decision. They are in a better position to prescribe the best and safest products for babies. The information you’ve shared about paraben used as one of the ingredients in formalin is scary. It’s another reason not to use sunscreen on babies. Adults should be wary when using it, too. Everyone should do their best to avoid sun exposure between 10am to 4pm because that is the hottest time during the day. They should stay indoors or under a shade. If it cannot be avoided due to important errands, they should protect themselves. I really had a tough time growing up during those days that the sun had effects on us in this part of the country and I doubt if my mom knew about anything called sunscreen. I am glad to have read about for it will help me to give my future kids the best parental care. Some parts of the country in the world have harsh sun and it affects kids so much because of how tender their skin is. Sunscreen is a very good product for parents to use and protect their kids skin from the harsh effects of the sun. Baby’s skins are too tender and delicate to be exposed in hot sun. If it’s up to me, I would really recommend parents not taking their babies anywhere near sun. Even with the use of sunscreen, I still wouldn’t be comfortable as I’m quite well aware that most of the chemicals used for the production of these sunscreen are harmful to these babies skin on the long run. Parents need to be very careful with what they put their kids through. They are babies and tenderness is what their entire body is. Exposing them directly to harsh sun during summer without any protection is definitely going to be inimical to their skin. Dehydration of the skin and cracking might occur as a result of how soft and tender their skin is, so therefore it’s paramount they are applied sunscreen before being exposed to the sun. I would even prefer to always cover their body with comfy clothes at all times.